I'm starting a new weekly feature for my blog called Fridays Frights. First up is the Maryland Legend of Crybaby Bridge. There is a purported "Crybaby Bridge" off Beaver Dam Road in Beltsville, near the Department of Agriculture's Beltsville Agricultural Research Center. It is in or near the areas where the legendary goatman has reported to have been seen. There is another on Governor's Bridge Road, in Bowie. 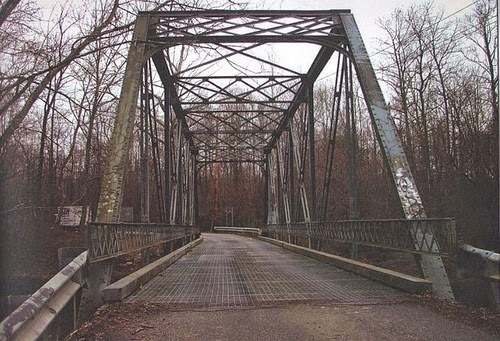 This bridge is a late 19th/early 20th century steel truss bridge; legend states that a woman and her baby were murdered in the 1930s. It is also said that in the early 20th century, a young woman was impregnated, but not married. In order to avoid judgment by family and peers, she drowned her baby in the river. Purportedly, if one parks one's car at or near this bridge, a baby can be heard crying; sometimes a ghost car will creep up from behind, but disappear when the driver or passenger turns around to see it. In Weird Maryland: Your Travel Guide to Maryland's Local Legends and Best Kept Secrets, authors Matt Lake, Mark Moran and Mark Sceurman include three first-person narratives of crybaby bridge experiences in Maryland. The locations mentioned are the Governor's Bridge Road bridge discussed above, one on Lottsford Vista Road and a third unspecified, but possibly described the Lottsford Vista Road bridge as well. The latter narratives make mention of purported Satanic churches near the bridge and appearance of the Goatman. Do you have a local legend you would like to share? I really like this new addition to your blog! Creepy! Thank you Thomas, and thanks for stopping by.